5-Reel 50-line Slots : The objective of Football Carnival is to obtain winning symbol combinations by spinning the reels. Total bet per game round = line bet X 50. This is due to the fact that the game Football Carnival is played using a fixed number of 50 active lines. Clicking Spin spins the reels with the currently selected line bet. During the reel spins theSpin button changes into Stop. Clicking Stop ends the spin animation and immediately displays the spin result. Clicking Bet Max spins the reels with the maximum line bet. Reels can also be spun using the Auto Play function. Mouse over the Auto Play button to display the list of options. Select the number of spins to be played automatically or choose 'Until Feature' to spin until the Free Games round is triggered. Clicking on an option starts the Auto Play function. The Auto Play button changes into Stop during the Auto Play mode. The Auto Play mode ends when the reels have been spun the number of times determined by the player, or when a Free Games round is triggered if you chose 'Until Feature', or when you click Stop. Clicking Info opens the reference screen describing different game components. Clicking the Prev and Next buttons in the lower right-hand corner of the screen enables navigating between the different info screens. The Football Free Games screen describes the symbol combinations necessary to trigger the Free Games feature and describes its rules. The Stacked Symbols screen explains what the stacked symbols are and outlines the rules for calculating their payouts. Clicking Show Paylines on the Paytable page, opens a screen that illustrates all possible payline combinations. Clicking Hide Paylines closes this screen and returns to thePaytable page. Paylines are represented by lines that appear over the reels as illustrated on the Paylinesscreen of the Info page. All 50 active paylines can register wins. If two payline winning combinations occur on the same line, the higher of them is paid out. If more than one active payline has a winning combination, the winnings are accumulated. The maximum possible win from a single betting round in the game is 500 000 EUR/GBP. A betting round is initiated by a paid spin, and can lead either to a single win or to a series of wins by triggering additional paying features like Bonus and/or Free Games. Should the resulting total win become greater than 500 000 EUR/GBP, the excess amount will be ignored and the player will receive exactly 500 000 EUR/GBP. Maximum payouts will be paid in the currency of your Paddy Power account. The Wild symbol can stand for any other symbol, except for the Scatter symbol, to make the best possible winning combination. There is also a separate payout for 2 or more Wild symbols on a payline, as seen in the Paytable. This is paid out instead of the regular symbol win if the win amount from Wild symbols is larger than the win from the regular symbols (by Wild standing in). The Scatter symbols do not have to occur on any particular payline. If there are 2 or more Scatter symbols in any position in the spin results, the payout is multiplied by the total bet and added to the payline winnings, if any. In addition, 3 or more Scatter symbols anywhere on the reels during main game trigger 10 Free Games. More information about the Free Games can be found below. 3 or more Scatter symbols in any reel position during the main game trigger 10 Free Games with an increasing win multiplier and a frozen Extra Wild symbol. Free Games begin with a multiplier value of X2. This value increases by one after every second spin during Free Games (i.e. X2, X3, X4, etc.). All wins received during Free Games will be multiplied by the respective multiplier value. This means that the first and second spin wins, if any, during Free Games are multiplied by X2, while the third and fourth spin wins, if any, are multiplied by X3, and so on. The Extra Wild symbol appears only in the middle position of reel 3 during all Free Games and substitutes for all symbols except Scatter and will remain in that position for the duration of the Free Games. To start the Free Games, click on Click to Start. A message will then appear explaining that 10 Free Games have been won with an increasing multiplier and an Extra Wild. Click on Continue and after a while the Free Games begin automatically. During the Free Games, the reels are spun automatically using the same bet per line as on the spin that won the Free Games. After each spin, the win is displayed in the Win field. 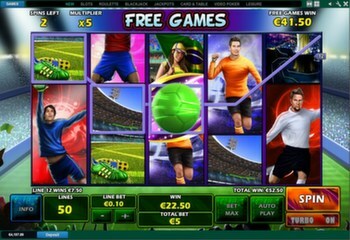 The Free Games Win field shows the accumulated winnings from the current Free Games. The Multiplierfield shows the win multiplier value. The number of free spins remaining is shown above the reels. If 3 or more Scatter symbols appear in any position on the reels during Free Games, only a payout is won but more Free Games are not retriggered. More Free Games cannot be won during the Free Games feature. After all Free Games have been completed, a result board summarizes the winnings. Game Winshows the winnings that were received from the main game spin that won the Free Games.Feature Win shows the winnings that were received during the Free Games. Total Win shows the accumulated winnings (Game Win and Feature Win added up).